An Oshawa man - previously arrested on more than 330 firearms charges - is now facing an additional drug charge after police found 42 kilograms of Carfentanyl at a Pickering residence in late September. An Oshawa man — previously arrested on more than 330 firearm charges — is now facing an additional drug charge after police found large amounts of a deadly opioid at a Pickering residence late September. Durham Regional Police say they discovered a suspicious substance while responding to a carbon monoxide alarm in a residential Pickering neighbourhood on Sep. 20. After obtaining a warrant, Durham police, along with the Ontario Provincial Police's clandestine lab unit, found 33 guns and 53 kilograms of an unknown substance in the basement of the home. Lab results from Health Canada have now identified 42 kilograms of that substance as Carfentanyl. It's the biggest Carfentanyl seizure in Canada, Const. George Tudos told CBC Toronto. 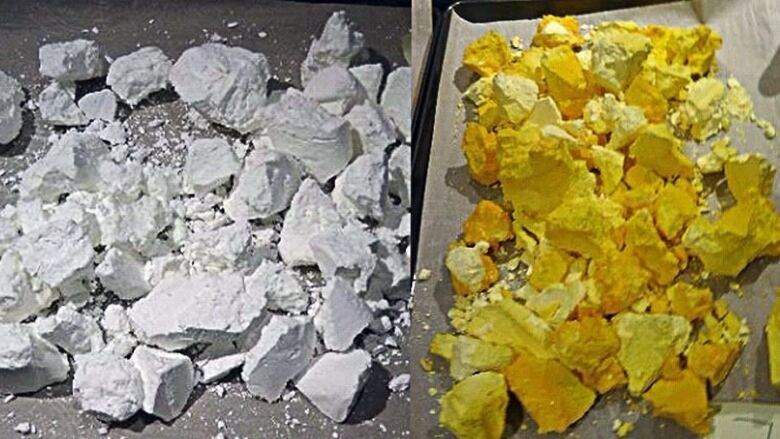 "Carfentanil or carfentanyl is a synthetic opioid similar to fentanyl but 100 times more potent," Durham Regional Police said in a news release. The total seizure equals 420,000 doses of carfentanyl. That carries a street value estimated at $13 million dollars, police say. "This is a very deadly drug. It's not only dangerous for users but also for any first responders that are helping people that are overdosing or anyone that comes in contact with this drug," Tudos said. "A very small amount of this drug can be lethal." A 33-year-old man is in custody in relation to the charges.